Me + Hulk = ? “Really? Why is that?” At this point it could go either way: best/worst. Based on the student and the fact that we were standing outside at the end of a long day, I was betting on worst…something about anger, maybe? Best possible thing at the best possible time! 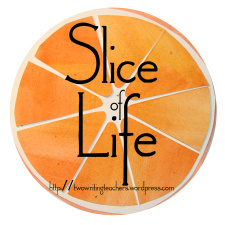 Posted on May 17, 2016 Categories Slice of LIfe, Third GradeTags conversations with kids, SOL, Third GradeLeave a comment on Me + Hulk = ? I have written about my kindred spirits – the friends that I have found in the last few years. However, with the help of Jill Pickle, one of those friends, I realized that kindred spirits aren’t limited to your peers – they come in all sizes. The weather is warming up, the snow is melting of the playground, and the children are staying a little longer after school, playing. This shift means that we have visitors afters school, former students (4th and 5th grade) stop by to chat. It is one of these students, let’s call her R, that I realized is a kindred spirit. Each day she must wait for her grandma to wrangle her little brother, and so we get to spend a little time with R.
“The Titanic sank!” I pointed out. “The Titanic without the iceberg,” she amended. Oh, I love the change in weather for so many reasons. One of them being our time with R, a kindred spirit.